« We’re Having a Black Friday/Cyber Monday Sale at the LongLocks Boutique! 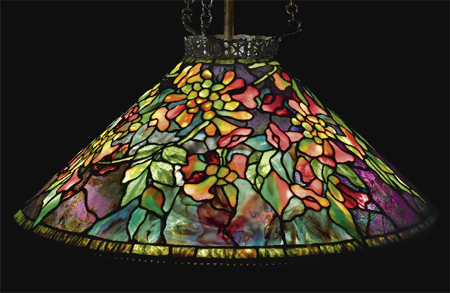 In 1902, Louis Comfort Tiffany’s glass studio in Corona, Queens, became known as Tiffany Studios. One of the greatest Art Nouveau designers in the world, Tiffany loved the impurities in cheap jelly jars. He saw color possibilities in the chemistry, which were absent from finer glass. When he could not convince fine-glass makers to recognize the value of these impurities, he hired English glassblower and chemist Arthur Nash, who invented favrile glass. What Nash managed to do was pour color into molten glass as the impurities were interacting, thereby embedding the color in the glass. Then Tiffany painted with it like Monet. Nash never shared the formula with anyone, and no one has ever been able to reproduce it since. 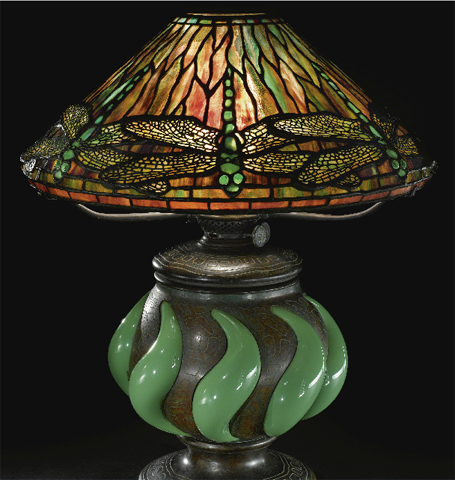 On December 15, 2011, Sotheby’s is having an auction of the best Tiffany Studios pieces currently on the market. A window has an estimated price of $600,000, a chandelier perhaps $700,000. The final hammer price will be much more. I hope a museum gets at least one of them. Here are some items and their details. Three-panel magnolia window, exhibited at the Metropolitan Museum of Art, April 12 – September 9, 1990. Estimated price: $400,000 to $600,000. Trumpet Creeper Chandelier bought by a private owner from the Macklowe Gallery. Estimated price: $500,000 to $700,000. 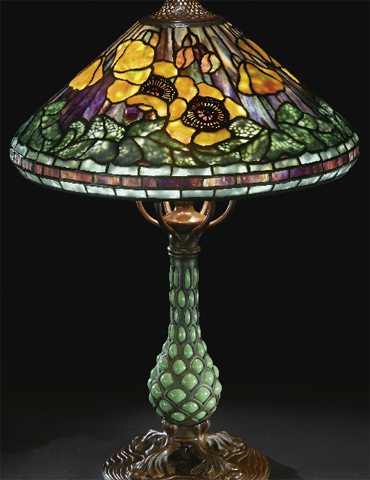 Poppy lamp with a rare blown glass “Pineapple” base from a Florida collection. Estimated Price: $90,000 to $120,000. Dragonfly lamp with a rare, early blown glass base from Brooklyn :-). Estimated Price: $70,000 to $90,000.